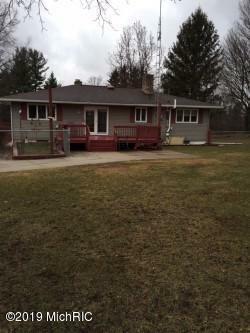 Enjoy country living in this nice ranch home minutes from town. 3 bedrooms, full basement, fireplace in living room. This home sits on a hill, has almost 2 acres with beautiful landscaping. 2 car detached garage, a 1 car attached garage and a 1 car carport. 1 acre fenced back yard, large deck. A new furnace, central air and a whole house generator. IDX provided courtesy of Realcomp II Ltd., via David Brigham Real Estate Company and Hillsdale County AOR MLS, ©2019 Realcomp II Ltd. Shareholders.